Of all the many trapeze artists I've had the pleasure to present, not a single one ever considered such a career in flight as a plan B or something to hold them over until their real dream kicked in. The trapeze is either for you or it is not; and you know it in your bones. It's a calling. The trapeze chooses you -- you merely comply. Estefani Evans Tuniziani understood this even as a 10-year-old girl in her native Brazil. A descendent of five generations of circus artistry, Estefani likely had access to every imaginable discipline and apparatus related to her field. "I began my career as a contortionist. My mother wanted me to do hand-balancing, but, once I touched the trapeze, I wasn't coming back down," she smiles. It was love at first flight. Meanwhile, in Venezuela, 9-year-old Ammed Tuniziani was already taking flight in the family business. Three generations strong, two of which are firmly established in flying trapeze. Thus, it was clear that Ammed's trajectory was set. Their respective talent for flight would lead them to one another. It was during a 2010 contract with Cirque du Soleil that the two aerialists took notice of each other. "He made flying look so easy, and he also happened to be the cutest man I ever saw," says Estefani. "For me it was love at first sight." "My affections for her were immediate and only grew stronger the more I watched her fly. She was braver than I thought and an amazing flyer," says Ammed. In 2013, now married, with son Davi in tow and another child on the way, the Tunizianis joined the cast of Ringling Bros. and Barnum & Bailey® Presents LEGENDS℠ as members of the explosive Solar Hawks flying trapeze troupe. Ammed soared while Estefani was grounded awaiting their second child. Along with his fellow troupe members, Ammed would display that aerial prowess that made his wife see stars the first time they met. "As an artist, I love watching him fly. He's simply amazing. I don't want to say he's perfect, but he comes very close to being so," brags Estefani. The young family would soon welcome their newest member, daughter Alysha. Estefani would then take to the arduous task of rebuilding her body for flight. "She's Wonder Woman!" Exclaims Ammed. "Believe me, trapeze takes a lot of dedication, love and strength, and having a family takes a lot more than that. So, doing it all at the same time, she has to be Wonder Woman." The circus is a haven for wonder women. Throughout my entire career as Ringmaster, I've marveled at women the likes of Estefani who seem to have an endless supply of ingenuity, energy, grit and grace. "After I had Alysha, it took 10 months before I was ready to perform, " she said. At last she was ready to once again soar alongside the love of her life. 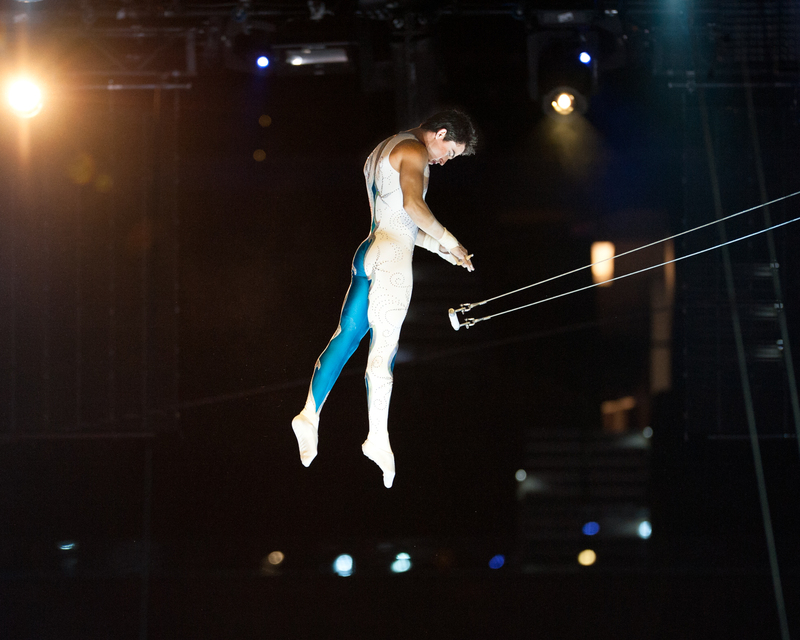 "Trapeze is my passion and my life; so performing with my wife makes it 10 times better," says Ammed. So imagine the dismay felt by Ammed when he found himself sidelined by injury, unable to take flight beside the woman he loves. The emotional distress of being unable to work makes the actual injury incidental. Circus artists hate being indisposed. To be trapped by the limits of one's body when your livelihood is a display in miracles is an all too human paradox. Ammed would eventually make his long-awaited return, and from the looks of it he is stronger and more dynamic than ever, as is evidenced in the quadruple somersaults he's attempting in practice. It's a glorious sight to behold, watching these two artists, man and wife, side by side, in flight. 40 feet above the ground, leaping and whirling, they seem to take on a celestial, even mythological air. Beautiful is too weak a word to describe the sight of the Tunizianis alongside their aerial mates. "For those 8 minutes while we are performing, my adrenaline is so high. It's like being launched into space and driving in a NASCAR race at the same time," says Ammed. Though their talents grant them the ability to ascend heavenward, their concerns are very much earthly bound. After all, they're a family. "I never feared anything, but when I had children I finally understood my mom. You know your family needs you, and you have to be there for them," says Estefani. "When we began our family the thought got into our heads that we have to be extremely careful now that we have children, but at the same time, being so careful and worried might cause us to get hurt," says Ammed. "We're young parents and we're learning together. We have to remain focused at all times. No matter what's going on, even between us," says Estefani. "We just have to trust God that everything will be okay," concludes Ammed. As for the next generation of Tunizianis, Ammed and Estefani are perfectly content if their children choose a path less ethereal. "I would love for them to continue our legacy, but only if that's what they want," says Ammed. "We carry this in our blood, so naturally I want to see it into the next generation, but ultimately it is up to them," says Estefani. For the very young Tunizianis, Davi and Alysha, that decision is a long way off. In the meantime, their mom and dad, still young, glorious and brimming with extraordinary skill at the cusp of their artistic prime, will continue to carry the legacy of generations past. "I'm proud of us," says Estefani. She certainly has every reason to be.